Trick kit; 14" snare, 10", 12", 14", 16" toms, 2 6" Rocktobans and 12" aluminum side snare. Playing since the age of 12, T.J. Snow has built a solid reputation as a rock drummer in the mid-west. He is known for his aggressive flashy style from anything from funk to metal. T.J. has played countless live shows over the years, and has become accomplished in the studio as well. His most recent projects have been Corpus, Lost Autumn and Granite Sun. 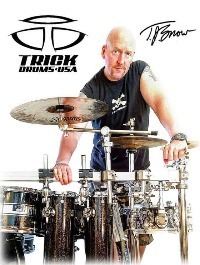 T.J. has a reoccurring blog in Modern Drummer Magazine.